We love spending time with our dog, don’t we? And why not? After all, he’s like a member of our own family. Dogs are known for their loyalty and they deserve the care and attention that we often fail to provide. Apart from the care and attention, it’s our prime responsibility to keep our pooch fit and active, both mentally and physically. Like us humans, dogs are also social creatures and they get bored easily. So if you do care for your dog, you must indulge in various fun activities to keep him entertained at regular intervals. If you want your dog to live a happy and healthy life, it’s paramount to ensure that he’s getting mental stimulation and enough exercise. Provided in this blog are five fun games you can play with your four-legged friend to keep him fit, active, happy and healthy. 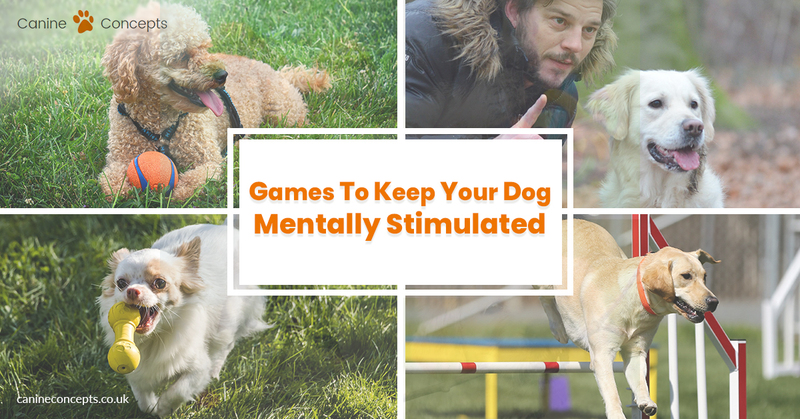 It might sound like a dreary choice of game to play with your pooch. But Hide and Seek is one of the finest fun activities that directly impact your dog’s mental stimulation. It’s not only a boredom breaker but is probably the best remedy to improve your dog’s natural tracking abilities. When you play hide and seek with your dog, he uses his natural scent-tracking abilities to find you. The game might get monotonous for you after some time, but dogs just love it and won’t get bored of it. Tug of war is best enjoyed when you have multiple pets. But don’t worry, you can also play it with your single pooch and he’s going to love it as much as you do. It’s a fun and engaging game which also helps you train your dog to practice good manners. Above all, it’s a great physical exercise and keeps your dog active and agile throughout the day. Before you start, it’s always good to ensure that your dog has a good hold over the ‘drop it’ or ‘leave it’ command. Playing Tug of War is also an effective way to teach your dog how to obey your commands. Frisbee is by far one of the most extensively played dog games and yet it never goes out of fashion. It’s a great exercise and encourages your dog to chase over long distances. Frisbee is always a great choice if you want to increase your dog’s physical strength, stamina and mental stimulation. If your dog doesn’t know how to catch a frisbee, you can start by throwing a soft and lightweight disk. Start with shorter distances and once your pup gets excited about the game, you can increase the distance as well. It’s a great indoor game that helps you keep your dog’s mind sharp. The game is pretty simple. All you have to do is take three similar cups and line them up in a row in front of your dog. Put a treat under one of the cups while your dog is watching. Shuffle them up and let your dog guess the cup having a treat underneath. If he guesses it right, then reward him and let him have the treat. You can also increase the difficulty level by adding more cups once your dog gets the hang of it. If you want to try something new, you can create your own agility course to keep your dog fit and active throughout the day. It’s always a good option to teach your dog some new tricks which is extremely good for their mental and physical exercise. You can find plenty of obstacle course items, dog games, and dog training equipment in the market that you can easily create your own agility course. At Canine Concepts, we provide an exhaustive range of dog toys, dog games, dog training kits and all types of dog accessories at the most competitive rates. With over a decade of experience in delivering world-class Canine and Feline products, we are the UK’s leading online pet store. Visit our website to explore our comprehensive collection of Pet Products and Accessories. My dog makes me laugh. He usually has little interest in digging, until he sees me doing it. If I dig a hole in one area, I guarantee that if I turn around, he will be giving a hand somewhere else in the garden. So why do dogs like digging so much and why in some cases can this be seriously destructive and require corrective action? Our dogs early ancestors learnt the art of digging from an early age. They learned that burying food for later retrieval kept it safe from other predators. Dogs discovered that digging dens helped keep them cool in hot weather and warm in cold weather. They also learned to dig out prey that lived underground. So it should be no surprise to find that our domestic friends still have a significant digging instinct. Dog digging is a natural canine activity which they can find highly enjoyable and therapeutic. Understanding your dog’s motivation to dig helps in determining the solution to stop or reduce this behaviour. Below are some suggestions to help correct digging behaviours. It is difficult to pin dog digging down to a single cause and to some extent most digging is motivated by boredom or the sheer fun of it. In all cases, punishing dog digging (particularly after the event) does not work and in all likelihood it will cause anxiety that may make the situation worse. Protection or comfort Dogs that spend a great deal of time outside can resort to the instinctive desire to have shelter, a place to keep warm and secure. Usually this would be as near to you as possible, perhaps near your house walls, possibly under windows so that they can hear you. Rarely would this sort of digging be in the middle of your lawn We never recommend leaving dogs outside for prolonged periods unattended. They are pack animals and need to be part of family life. If they are left outside, ensure your dog has a kennel near the house and possible under a window that is often open. It should not be in the hot sun or cold winds. Recreation or Boredom For some dogs, digging can be one of their most favourite things to do. It is one way of expelling unused energy, perhaps from lack of exercise. Other dogs simply love digging; they love the earthly smells, the feel of the mud and dirt, and the pleasure of digging. Refocusing this behaviour often achieves better results than attempting to stop it altogether. Install a digging pit filled with sand. You can start to refocus the digging by hiding treats in the sand. Also, ensure your dogs environment is full of interesting things and toys. Activity toys such as stuffed Kongs are ideal for outside activity. Have a range of activity toys to rotate to make them seem new. Food Some dogs are highly motivated by food. This sort of dog digging usually takes place at the foot of trees and shrubs, rather than at walls or boundaries. The digging can be in a ‘path’ layout, as the dog attempts to track burrowing animals such as moles. Some say that you should look for signs of underground animals and seek ways to deter them from your garden (at Canine Concepts, we believe all animals are equal and only condone humane methods to ‘deter’ rather than eradicate animals). Providing other forms of activity (see digging for ‘recreation and boredom’) may also help. Hiding food treats in a digging pit would also help refocus this dog digging behaviour. Attention seeking Digging in your presence is a symptom of this. Any behaviour can become attention-getting behaviour if dogs learn that they receive attention for engaging in it (even punishment is a form of attention). Ignore this dog digging behaviour. Give your dog plenty of attention and human interaction. Seeking escape Usually involves digging along a fence line. In this case you will need to look at the reason the dog wants to escape. This can be wide and varied and would warrant an article of its own. Some options to prevent digging at the fence line is to bury the bottom of your fence a foot or so underground or lay chain link fence on the ground and anchor the fence. Let your dog watch you dig the pit and praise them warmly if they give a helping hand. Encourage your dog to dig by making a fuss of burying his favourite toys in the pit and praising them when they dig them up. Start to introduce a command such as ‘digging pit’ and further develop the habit by hiding a dozen or so treats in the pit for them to sniff and dig out. If your dog does go to dig elsewhere, use your command ‘digging pit’ to redirect them to the correct location. Staying when told is another wonderful skill to teach your dog. It allows you to settle your dog down when you want a few quiet moments in the evening or to keep it out of trouble so you can check out a strange noise in the garden. More importantly, staying in place teaches your dog patience, impulse control and can prevent one of the most common behavioural problems; the inability to cope with frustration. Dogs who learn to stay when asked can be more fun to live with and are probably happier themselves after learning to control their own emotions. You will need to work on each of these one at a time. Start with all three factors in the lowest possible level of intensity. This means you need to start in an area where there are no distractions and you are only going to be one to two feet away from your dog. Ask your dog to sit and as soon as it does say ‘stay’ in a low, quiet voice and move the palm of your hand toward your dog as if you were trying to stop traffic. Stand still, look directly at your dog for only 1-2 seconds and then give it a treat from your other hand. Be sure you move towards your dog to give it the treat, so that it doesn’t have to get up to get it. After you’ve given it the treat, release him/her with your chosen release word (e.g.’free’, ‘that will do’,’finished’,etc). Then walk away from your dog and let it do what it wants. Do not praise or pet your dog, you want the fun part to be staying in place, not getting up. This will be hard for you, so concentrate on staying quiet when you release him/her – I promise you it will pay off. Repeat this exercise 4-6 times per day, asking for 1-2 second stays that are so short, they are almost silly. Your dog will learn more quickly if you have several brief sessions throughout the day, rather than one long one, once a day. Throw in a single sit/stay here and there throughout your day, perhaps whilst you are waiting for the kettle to boil, or whilst you go into another room briefly, or just when your dog least expects it. Make sure the distraction level is still extremely low, and that it knows you have treats on offer at this point. Don’t be tempted to ask your dog to stay too long at this stage; this is one of the exercises in which creating a solid foundation by going slowly at the beginning will pay off hugely in just a few weeks. So patience, patience, and more patience! This exercise is also great at practicing on how to give clear and consistent cues with both your voice and your body. Concentrate on saying ‘stay’ with a low, relatively quiet voice. Your dog is more likely to stay in place if your voice drops a pitch or stays flat. Think about your body language; are you using a clear hand signal that is different from your sit cue? Are all members of the family using the same cue? Are they all using the same release word? Remember consistency from everybody is key in communicating with your dog in a clear manner. Also, try not to confuse your dog by using the same word to praise and release it. So, saying ‘good boy/girl’ or ‘good’ as a release word is not advisable, as these are the most common words used to praise our dogs.